This lovely Romantic Zen Cabin was featured in both NY Magazine and The NY Times as the spot to go to when vacationing in Woodstock. Secluded, romantic, Japanese-styled designer's cabin is located down a private road, surrounded by acres of beautiful woods, with a small stream running down the hill beside the cabin, the perfect venue to become acquainted with nature. This large non-Smoking cabin is over 1,000 sq ft and features wonderful views of the woods from every window. It has beautiful Asian slate floors, a cool slate shower and marble bathroom and the romantic claw foot bathtub in the living room which faces the deck and stream. The spacious bedroom has a writing desk with an old fashioned typewriter and is the perfect place to become inspired. The living area is furnished with an extremely comfortable futon sofa which folds out into a queen bed. The multimedia area, has a flat screen TV with basic cable channels as wifi is accessible throughout the cabin. Wildlife abounds in the area, white-tailed deer (drive carefully at dusk), wild turkey and baby black bears are up and about. Not to mention the fox, squirrels and the dozens of species of birds that makes exploring this property very rewarding. Only 1.7 miles to the center of Woodstock's famed shops cafes and Zagat rated restaurants. Take in a concert at the Kleinert, a performance at the Woodstock Playhouse or an independent film at Tinker Street Cinema. Hike nearby nature trails on Overlook Mountain, Poets Walk Park or the Ashokan Reservoir. This really is a year round destination: swimming holes abound in the summer, foliage in the fall is incredible, New York's best ski hills are only 30 minutes away for the winter, and the spring is simply magical. There are world class spas and restaurants, and fun shopping in the quirky town of Woodstock, America's most famous small town and birth place of the musical revolution of 1969. 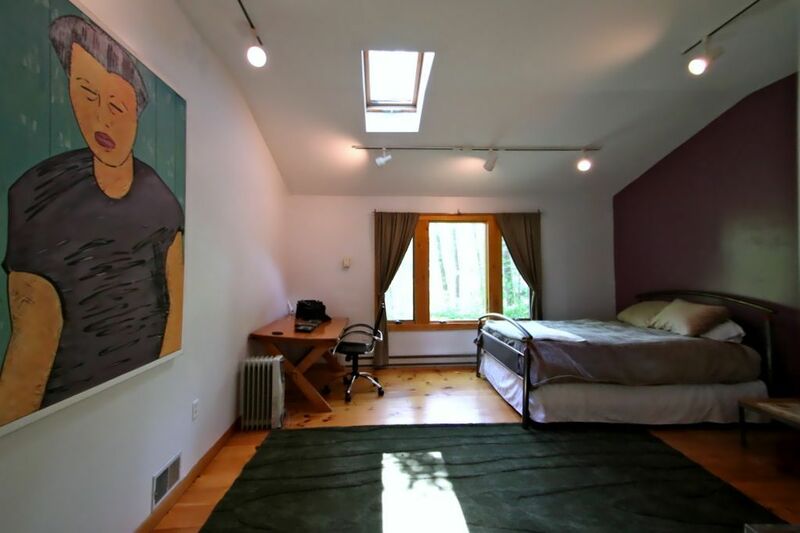 Keywords: Spacious, Romantic Zen Cabin in the woods. I've enjoyed a diversified life with careers in Environmental Science, entertainment, real estate and design. I live in New York but grew up in Canada and Bermuda, two wildly different climes! When it comes to property I tend to prefer the extremes....extreme country, or extreme city, and that's one of the things I love about Woodstock. It's less than two hours from New York City, but it's a million miles away with respect to it's ambiance, culture and attitude. Woodstock is a fabulous combination of getting away from it all while still having plenty to do. Serenity and Privacy. Secluded yet not isolated. Just perfect! It has so many unique features, which include a claw foot tub located in front of the gas burning stove. Take a soak whilst enjoying beautiful wooded scenery. A spacious bedroom with writing desk (and even a typewriter if you want to feel inspired). An outdoor desk with grill and plenty of room to just relax. Hike the amazing Overlook Mountain just up the road! Visit or hike up to the world-renowned largest traditional Tibetan Monastery in the US built into the mountainside. Take a bike ride along the winding creeks and back roads, or explore the colorful local farmers and flea market in the center of town. Find the numerous swimming holes around the area. This really is a year round escape, enjoy the wonderful fall foliage and enjoy skiing in the winter months. Beautifully secluded in the woods. Designer Futon, Cozy Gas Fireplace, Beautiful Views. If you are looking for a quiet place near woodstock this is the place. Close enough to town, its a 20 min hike. Wake up to babbling brooks right oustside your window. Spacious and comfortable with everything you could need to escape into the mountains. Nice, clean and relaxing cabin. A few minutes drive to all the Woodstock attractions yet far enough away to enjoy the tranquility of the area. I’m sure this cabin is amazing in the summer and fall but I love it in the winter/spring. The best cabin in the woods! I could not recommend the Zen Cabin more — it was a wonderful getaway weekend and Susanna was the PERFECT host! She was reachable, flexible, and more than willing to accommodate our needs. I rented both the cottage and the main cabin on the property, and Susanna was so helpful in booking to make sure there was space for each one of my guests. I really appreciated her insight. The cabin has the perfect fun, funky, and restorative energy, and I can't wait to go back! Great property and great house! Love this house and property, the tub and gas stove make for a great relaxing combo! Great hikes and food within minutes of this house! We had a great stay! What a wonderful experience. Look forward to returning! Spent a nice amount of time relaxing on the porch. Tub & shower are fantastic! Quick ride to town and great hiking nearby. Highly recommend giving this cabin a visit! Peaceful, comfortable, and nicely located. Had a lovely fall weekend in this peaceful little cabin with my wife and two sons. Highlights include the proximity to town and hiking trails, open floor plan, well-placed windows, gas fireplace, modern shower, spacious master bedroom and comfortable bed, cozy back porch with a nice view of the woods, and, if I’m being totally honest, high ceilings with great acoustics for my Bluetooth speaker. It is Woodstock, after all. Also really appreciated the responsive communication with owner and property manager and the clear instructions for accessing and enjoying the property. Hope to visit again soon! Take a bike ride along the winding creeks and back roads, or explore the colorful local farmers and flea market in the center of town - Enjoy the beautiful nearby waterfalls and swimming holes. 'The Big Deep' is a few minutes away in center of town. Zoom Flume New York's #1 Family Water Park is only 40 miles south. Horse lovers, take note! We are convenient to H.I.T.S. (Horses In The Sun) for summertime equestrian events - Levon Helms Midnight Ramble - Bearsville Theater - Antique shopping and much more are all nearby. Hunter Mountain is a skiers' paradise- Overlook Mountain, Bellayre Moutain, Windham Mountain and not be missed the Kaaterskill & Bastion Waterfalls.